Windows 8 is coming, and Microsoft didn't forget to take it as far as it can, preparing a whole new range of devices to accessorize your computer as it should. For all those that jokingly say that MS only makes good keyboards and mouses, here's one keyboard that looks the part. This new Sculpt Comfort Keyboard, with... well... sculpted forms, certainly seems as ergonomic as they can get, and it doesn't only look good as it also has a nifty new feature that might very well be something all future keyboards will take inspiration from: a larger, split space bar..
What does this split space bar do? Well, MS made a study that showed that 90% of the user only press the space bar with the right thumb, on the middle to right section of the space bar (check!) leaving a lot of unused space on the left. The study also showed that on the top 3 keys pressed were the "e" key, the space bar, and the backspace key. But the backspace key is always a "pain" to get to, as it forces us to "stretch" out to reach it. So, MS gives you the option to use the left "space bar" as a backspace key. And... once you start thinking about it... it makes perfect sense! 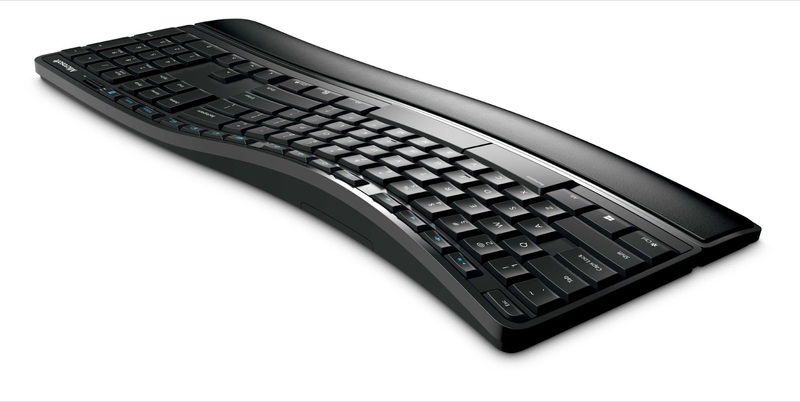 This curvaceous keyboard should pop up in time for Windows 8 lauch, and should cost around $59.